The word sampler derives from the Latin exemplum meaning example. Traditionally samplers were pieces of needlework executed to show competence in different examples of stitchwork and embroidery. 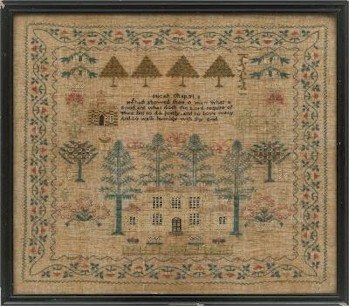 A George III Child's Sampler (FS24/570). Prior to printed pattern books, designs, motifs and stitches were passed from hand-to-hand. Women would collect these designs and stitches on small patches of cloth that they would keep and refer to over their lifetime. These samples would be collected and exchanged and, as a method of recording patterns, they proved invaluable. Early samples tended to be random in design with motifs and stitchwork applied wherever it would fit. The arrival of printed pattern books brought about a more formal style of sampler such as the banded sampler. This consisted of rows of numbers, Roman numerals and alphabet both in upper and lower case. 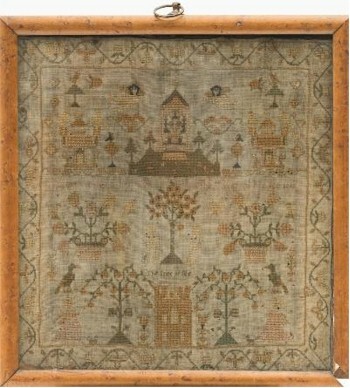 An Early 19th Century Child's Sampler (FS24/569). From the late 18th century, samplers became bigger, more picture like and far more stylized. Often used as teaching aids, letters and numbers were retained and the motifs were arranged in symmetrical patterns. Sometimes, religious text was incorporated into the design as well as images such as Adam and Eve, serpents and angels. Everyday life was also included in the sampler with the inclusion of designs such as flowering shrubs, birds, butterflies, insects, houses, monarchs, stags, hounds and cherubs. The threads could be of wool, silk, silver and even gold wire. Most samplers give the name of the person who stitched the work, their age and the year the sampler was completed.